There's plenty already written about the standard ways of cutting dovetail joints in books and magazines, so I'll try not to repeat too much of it here except for comparison. In this article I'm going to stick to making regular through-dovetails, while at the same time exploring some ultra-simple workshop jigs and alternative methods that make the job more efficient. Shoulder lines mark the bases of the sockets between tails or the sockets between pins to guide the maker. They are removed with a plane when cleaning up the finished joint. Marking shoulder lines can be a fiddly process and is prone to causing errors. The standard tool used for shoulder lines is a marking gauge with a pin, or more effectively a cutting gauge with a knife-edge or disc. The depth of the gauge is set to the thickness of one piece, then used to mark the other. The two pieces of wood are swapped and the gauge re-adjusted for the second piece. Instead of using a gauge, try this direct marking method. It cuts out the adjustment stage of the process completely, not only saving time but also eliminating a source of inaccuracy. Place one piece of wood flat on a clear bench - say the one destined to carry the tails. 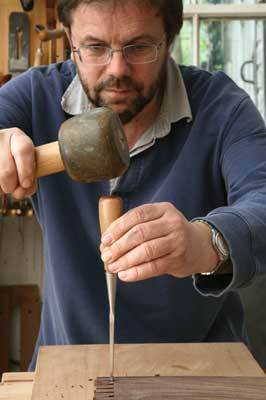 Lay the flat back of a chisel on it with a sharp corner just overhanging the end. 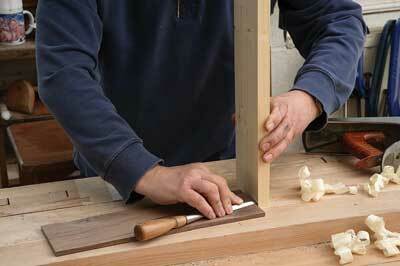 Stand the other wood on end, gripping it safely above the level of the chisel. Slide the face of the vertical wood across the chisel corner so as to score a shoulder line for the sockets between pins. Turn this wood around to mark the other side. 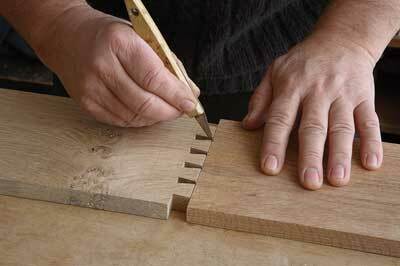 Swap the two pieces of wood over and repeat the technique to score a shoulder line for the sockets between tails. Again be careful to keep your grip well above the chisel. If you want to see this method in action, click here. 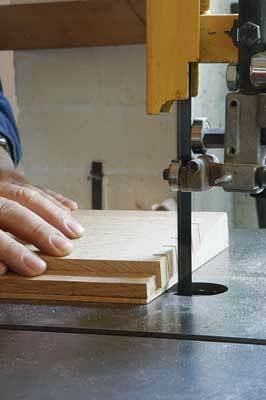 The bandsaw is the ideal machine for so many jobs, and this includes cutting dovetails. With a normal blade the tails won't be quite as fine as you could accomplish with a high quality dovetail saw, but the process is much quicker. 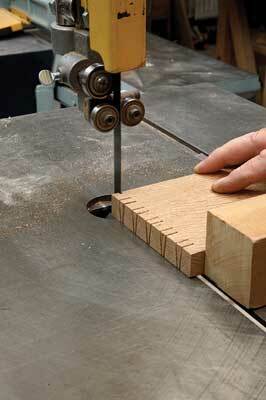 It's also more flexible and allows finer joints than a proprietary dovetailing jig can achieve. The 'jig', if I can call it that, is simply a large wedge sawn to match the taper angle of the tails. It needs to have high friction on one angled face so it grips the tails and low friction on the other so it slides along the fence. 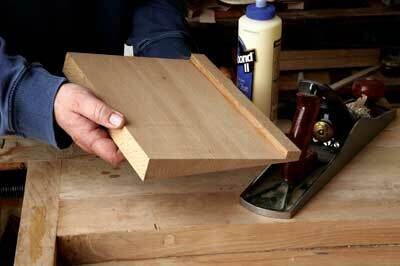 To achieve this glue a strip of medium grade sandpaper to one face and rub furniture wax on the other. 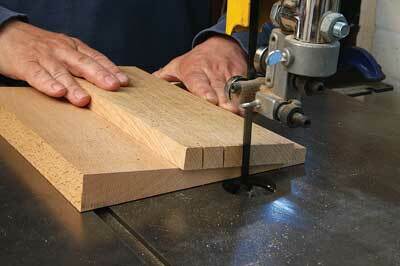 Set the ripping fence on the bandsaw table alongside the blade and place the waxed side of the wedge against it. Press the timber firmly against the sandpaper side of the wedge. Adjust the fence position so that the blade roughly aligns with a tail mark then slide the wedge in or out to fine-tune the position. Cut each tail up to the shoulder line, ensuring that the wedge moves with the tail in both directions. 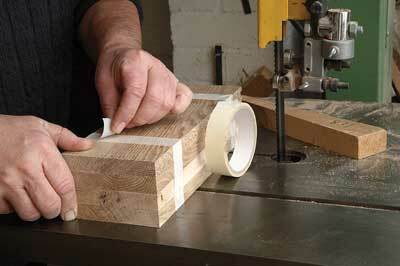 This is important to avoid distorting the cut or jamming the blade. Turn the wedge over to cut the other sides of the tails. 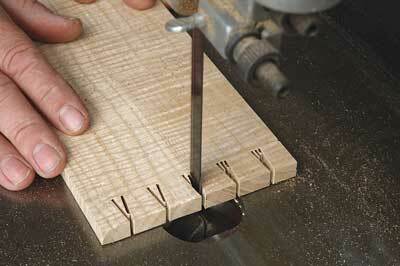 The second kerf may start a millimetre or two away from the first if you want to make coarse tails. 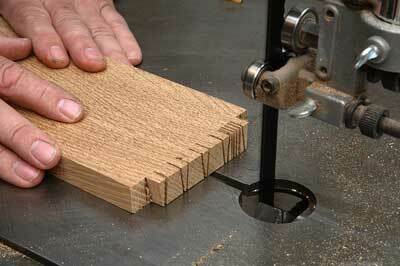 Alternatively, start in the same kerf entry to make fine tails. By nibbling out the centre of each tail with the bandsaw blade, the removal of waste is made much easier. Be careful to saw just up to the shoulder line, or for security, stop a hair's breadth short of it. We normally make furniture dovetails in sets of two, four or more and the bandsaw has plenty of capacity so it makes sense to stack the wood up then saw the sides of the tails all at once. Tape the stack securely so the pieces can't accidentally move out of line. As well as saving time on cutting, this method saves time on marking out - only the top piece needs to be marked - and ensures that all the tails match. Disadvantages to look out for are the risk of misalignment in the stack or in the blade itself. For finer joints that are hand-cut rather than using a bandsaw, the bulk of waste from the sockets between tails is normally sawn out with a coping saw. This leaves a ragged shoulder line, which can then be chopped and pared straight with a chisel. If the wood is reasonably thin and well behaved like this walnut, the socket waste can be chopped out directly with a chisel. Make sure the chisel is narrow enough to fit the socket a few millimetres in front of the shoulder line because deep chopping will indent the wood. Chop halfway through in this position. 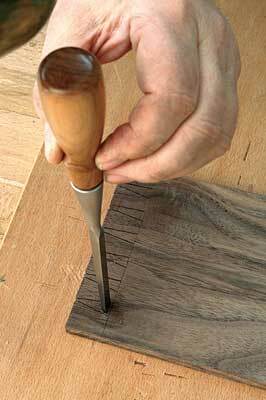 Make a second cut on the shoulder line with the chisel resting in the mark. This second cut is removing a thin chip so there shouldn't be any indentation. 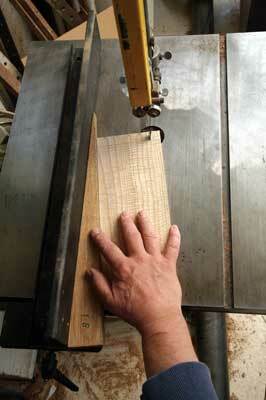 If the wood is harder you may need to make several chops and finally pare down to the line. Sometimes the sockets between tails require extra paring to allow the tails to fit and there is a danger that if overworked the shoulder line becomes gappy. 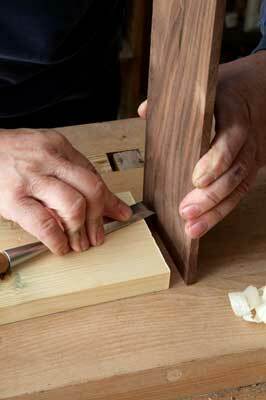 The chisel back must be held vertical for chopping sockets, otherwise the shoulders will not be flat. To ensure this is the case, stand edge-on to the chisel and position the wood so you're sighting along the shoulder line. That way you can see that the chisel back is vertical. 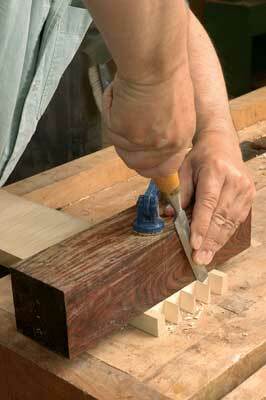 Another way to ensure the shoulders end up straight and flat is to use a guide block to steer the chisel. This is a decent chunk of square section hardwood clamped directly on the shoulder line. 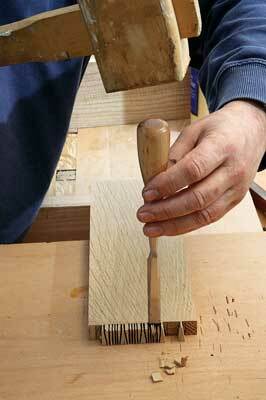 With the chisel back pressed flat against this block it can't possibly leave a humpy shoulder or undercut the line. The traditional way to mark out pins is to use the ready-cut tails as a kind of template, marking all around the inside of each socket. This is an awkward stage requiring a very thin knife and it's unnecessary if you intend to cut the pins on a bandsaw. Press the wood with the pins end to end against the wood that's destined to have the mating tails. Make sure the edges of both pieces are aligned. 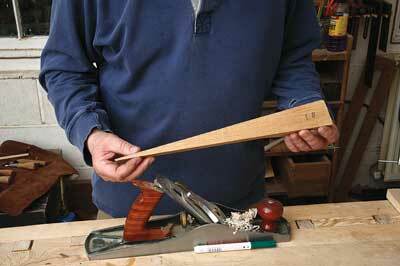 Use a sharp knife to mark the positions of the tail corners on to the end of the adjacent wood. There's no need to mark the angles of the tails as these are taken care of automatically by the cutting process. 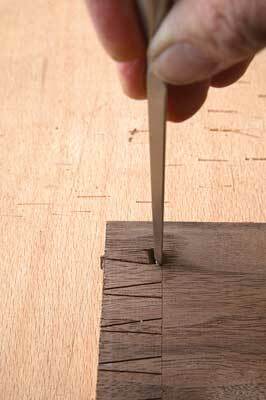 Bandsawing dovetail pins is quite a different process from the tails but equally straightforward once you're set up and have conducted a few tests. The 'Jig' for sawing pins is also a wedge cut to the taper angle of the joint, but this time it's a wide flat wedge that will form a sloping platform. The wedge has a batten glued along its narrow side forming a raised fence to guide the wood. The wedged platform is laid on the bandsaw table behind the blade. Clamp a batten across the back edge of the table, or wedge it between the table and guide rail, to act as a fence that locates the platform. The platform must first be slid sideways to align the knife marked position with the blade. 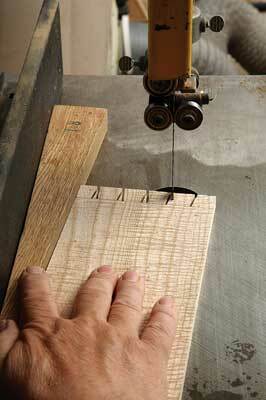 To cut one side of each pin, the wood is laid on the platform and run along the battened edge into the bandsaw blade. The platform is then slid sideways to align with the next mark. The platform is then turned around to slope the other way so that the second side of each pin can be sawn. The thickness of the bandsaw blade is significant so the cut is always made on the waste side of the knife line. When the joint is fitted the resulting pins should fit cleanly without any fettling. This is probably the trickiest stage and can take a bit of practise to get right. The end shoulders are sawn off on the bandsaw using a 9° sliding fence. Because the blade is vertical and the pin side is angled it's not possible to cut the waste away completely on the bandsaw. 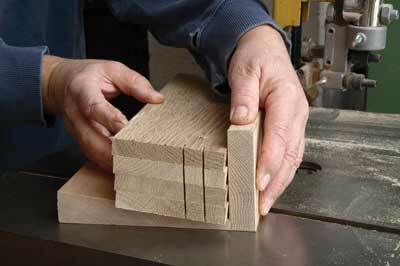 A couple of strokes with a tenon saw will finish the job. The sockets between pins are relatively wide, particularly if the joint is fine with narrow pins. To make it easier to remove the waste I simply make a number of freehand cuts with the bandsaw blade dividing the waste up into thin chips, again being careful not to saw into the shoulder line. 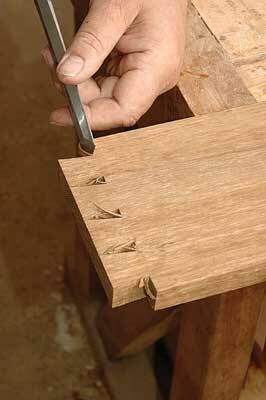 The finely divided waste between pins chops out easily with a wide bevel edge chisel. The chisel needs to be slanted when chopping deeper into the sides of a socket, but it starts off upright so that the blade sits just ahead of the shoulder line. Stacking boards to cut a small batch of pins at once is less obvious than stacking tails, but it can be done with care. A modified wedge platform is used with a high vertical fence attached to one side. As with stacked tails the cut is made according to marks on the top board. Piling the sloping boards against the vertical fence automatically staggers all the lower boards to the correct position to cut each pin. Having made a set of matching pins and tails, it can be disheartening to find that they don't fit together. If they have been carefully marked and sawn the reason may simply be that the inner edges of the pins are catching on the insides of the sockets. We can't lubricate the joint, so the way to reduce friction is to chamfer the leading edges of the tails. In practice this means paring a splinter from the inside of each tail on its underside, starting just below the tip then chopping across its base. Removing this sliver of material has negligible effect on the finished joint and can't be seen, but eliminates the risk of loosening the joint by shaving its sides. There's certainly more than one way to tackle any joint and which is best on any occasion depends on many factors. I hope this article suggests a few ideas worth checking out to broaden your range of dovetailing techniques.